In 2006 the historic Maas Brothers building was demolished to make way for yet another skyscraper in downtown Tampa. However, due to the downturn in the economy, construction of the skyscraper never began. Currently, all that remains where the once majestic Maas Brothers building once stood is a parking lot. Having lived in Tampa my entire life, I have seen many historic buildings fall into disrepair and, like the Maas Brothers building, eventually destroyed. Although some buildings, such as the Floridan Hotel, have been restored to their former glory. Witnessing the demise of the Maas Brothers building reminded me how, for many of these historic buildings, time is running out. The photographs above show the Maas Brothers building. 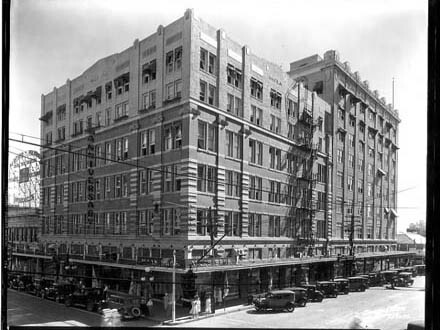 The black and white photograph, from 1931, shows the building in its heyday. 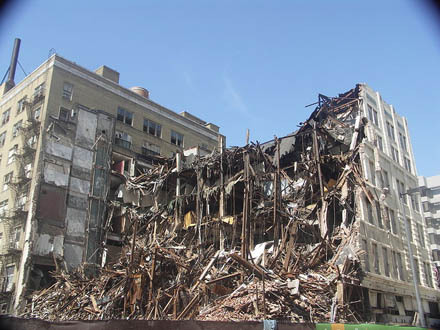 The color photograph, from 2006, is of the building’s demolition. Demolition of the Mass Brothers photograph courtesy of BaronPlourde, via Wikipedia. As you browse the Tampa Changing gallery, you’ll notice each historic photograph is paired with a matching modern re-photograph. By displaying these photographs together, viewers can easily see how the scene has changed over the years and how it has stayed the same. I hope this unique experience will help illustrate Tampa’s rich architectural history, its evolution, and most importantly, the ongoing need to preserve what remains. Tampa Changing was meant to be a collaborative effort. As such, if you have any photographs from Tampa’s past that you would like to share, have any annotates about the City, or would like to submit your own re-photography, please feel free to contact me. My name is Bryan Weinstein and I’m a 30 year old Tampa native. I received my bachelor and master degrees in Civil Engineering at the University of South Florida. During the week, I work as a transportation engineer at Tindale-Oliver & Associates. However, on nights, weekends, and while on vacation I am a photographer. Any other free time I have is spent playing ice hockey, kayaking, mountain biking, and traveling. When not practicing engineering or re-photographing sites in Tampa, I am usually busy traveling and photographing exotic locations all over the world. I would like to thank the following websites for their support of Tampa Changing.